To perform a simple filtering (for example, to show only new reports) click at the right corner of the column's header and pick up a value to show. Any reports that have other value for the selected column will be hided. At the bottom of the list there will be list of conditions for filtering. After you've set filtering by one column, you can also add filtering of the resulting list by several more columns. 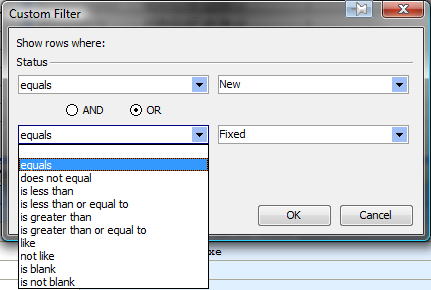 Just click at the right corner of the any other column's header and select filtering condition from popup list. Condition bar now will contain condition on two columns and list will be filtered by these conditions. 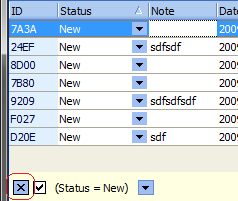 You can always add or remove more conditions on the other columns. There you can click on blue buttons to add more conditions or condition groups (there are two groups on the example above - the root "AND" and child "OR"). 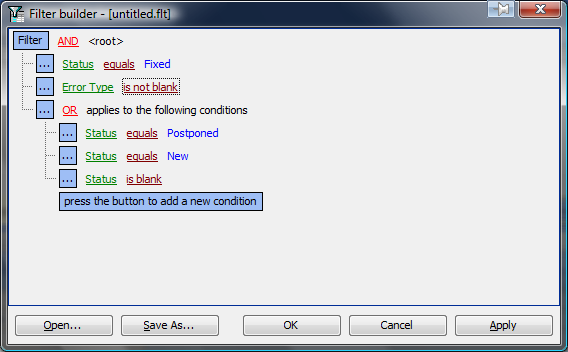 To remove condition or group just click on the corresponding "..." button and select "Remove Row" from popup menu. To change conditions you can click on green, red and blue parts of conditions and select values from popup lists or typing them directly into the edits. You can also use button "Save as..." to save all conditions to flt-file. You can load it later by using the "Open..." button. • You can click on the check box near the condition (bottom-left corner of the list) to temporary disable/enable filtering. Clicking on the "X" button near this check box will cancel filtering. • You can click on the down arrow button near the condition (bottom-left corner of the list) to see recently used filters and fast-switch to any of them by selecting filter from popup list. The down arrow button is only displayed if you have already set more than one filter.